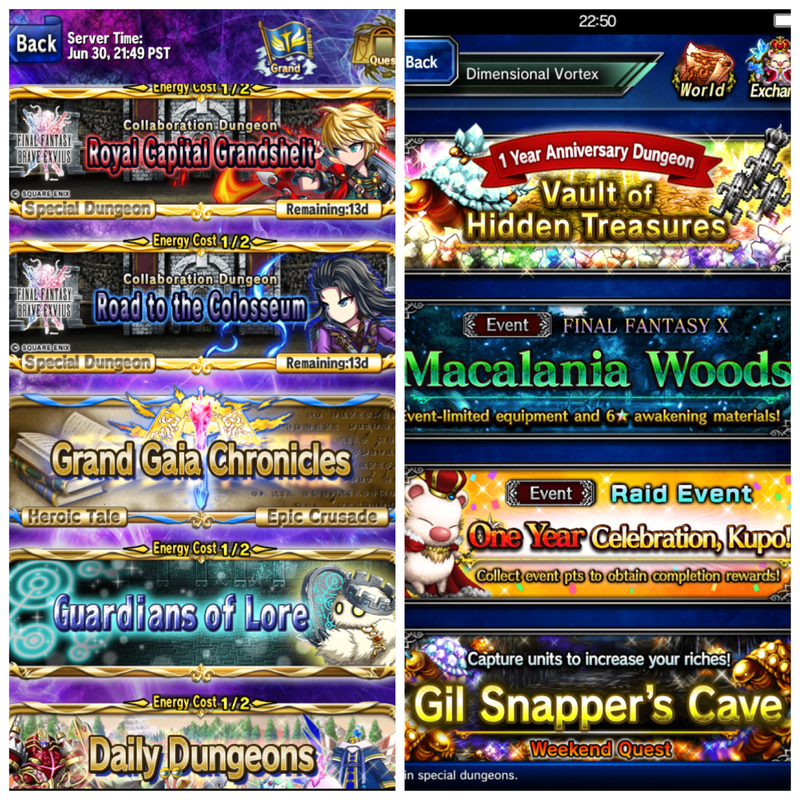 When I first started playing Final Fantasy: Brave Exvius, I was shocked by the striking similarities it had with Brave Frontier. Turns out that BF and FF:BE are both run by the same two companies, Gumi and Alim. Certain mechanics in gameplay are stylistically similar, and especially the menus had almost identical feels. One particular category of quests, in the Vortex Gate, has the same name in both games, even with the exact same symbol. The music, however, is drastically different. It’s safe to say that these are the most radically different tracks so far. While there are a few similarities, there are far more differences. Let’s first talk about the similarities. As the area in which rotating daily quests appear, as well as collaboration events, each game’s Vortex music has an ethereal quality to it. There is quite a bit of synthesized sounds in both tracks, and lots of sustained sounds, such as the high strings in “Vortex Gate“, and electronically manipulated longer sounds in “Not of This World“. The electronic sounds that appear in the Vortex music are pretty much unique to these tracks within the context of each game, especially in FF:BE. Brave Frontier‘s “Vortex Gate” is fairly up-tempo, with some spiffy percussion, mystical keyboard, and electronically manipulated and regularly sampled strings. Vortex Gate has a simple, fairly catchy melody, which is first played by the keyboard instrument, then passed along to the regularly sampled, then electronically altered string section. Final Fantasy: Brave Exvius‘s “Not of This World” is mostly devoid of tempo, melody, and standard or otherwise identifiable instruments altogether. Instantly beginning with a high-pitched sound of unknown origins, followed by more lower pitches of the same quality, “Not of This World” does an absolutely excellent job of creating the “other-worldly” feel. From 0:58 – 1:16 we are blessed with some sort of rhythmic elements, but the sounds themselves are unlike any actual percussion instrument one might play, without some heavy synthetic effects. Not to mention the howling ghoul sound effects at 0:27 and 0:29 are downright freaky!! Even with these stark differences, each Vortex track actually fits quite perfectly in each game. Brave Frontier‘s Vortex certainly has a more charming atmosphere where players can go to meet and recruit new characters. FF:BE‘s Vortex music is also used as the theme for the Farplane, an interactive exploration zone that is seems to be in outer space. The Farplane has an undoubtedly unsettling feeling as a whole, which is superbly supported by the equally unsettling—but still somewhat enchanting!—music. Find any other similarities or differences that I didn’t talk about? Leave your thoughts in the comments! Like what you just read? Consider becoming a patron on my Patreon page!